So a theme that we’ve seen in various stories is of that regarding an artist who can paint/draw something and have it come to life. But what if that power was in the hands of someone who draws rather poorly? All of those poor bees, jeeez. Wait, let’s talk about something else for a minute here. People who try to barge into bathroom stalls without knocking first when they see that the door is already closed. Why wouldn’t you at least tap the door a few times first? I don’t understand how people can’t see how rude they’re being when they slam into the door or try to pull it open without checking. Being scared while on the can isn’t cool. Anyway, so having your drawings come to life is a power that can indeed be wasted on somebody with no talent. Trying to draw weapons be effective because your guns wouldn’t work, your blades would be blunt objects at best, and anything that’s hastily drawn with no skill would likely fall apart upon use anyway. And the food thing. How would that work? Can you draw nutritional value? If a piece of food is poorly drawn does it become rotten/stale/etc upon its arrival to reality? Oh, and forget about transportation altogether. Any vehicle created would be more likely to kill the driver rather than provide any transportation whatsoever. Lastly, I shudder at the thought of all the new and terrifying creatures that would be drawn into existence. 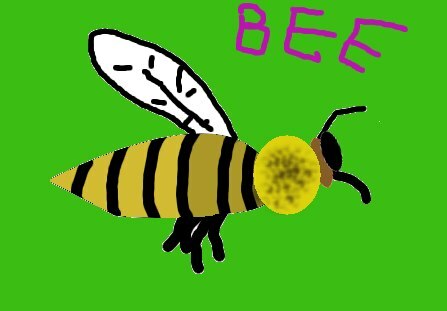 The following picture was drawn by Kenneth using Gimp, and he calls it the open source poorly drawn bee. Thanks Kenneth! This entry was posted in Bees!, Blog, Blogging and tagged 2012, Art, bee, blog, blogging, gimp, musings, pic, picture, situation, story. Bookmark the permalink.